Actress Jenny Mollen is the queen of packing school lunches — or as she calls them on Instagram, #dictatorlunches. 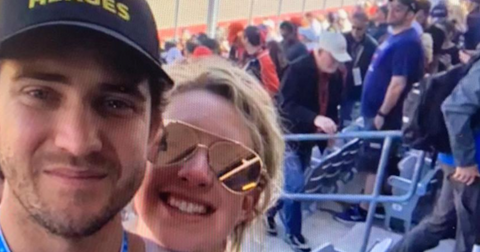 Jenny, who is married to fellow actor Jason Biggs, does not hold back when it comes to her son Sid's lunchbox creations, and luckily for her followers, she shares a photo of them daily on her Instagram account. "I think I might need to be committed w this one," she captioned a shot of a lunch that included Asian sushi rice (in the shape of a bunny), teriyaki chicken with pineapple, organic berries, and shrimp tempura. For another masterful lunch photo, she wrote. 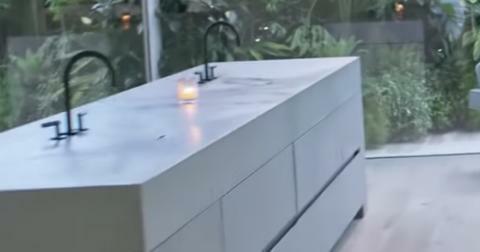 "Should I send an additional bowl for shells? (From right: Crab legs w dipping sauce, blinis w creme fraiche and paddlefish, strawberry grape cheer pyramid, lemon wedge)." However, Jenny is not the only mom that is overachieving when it comes to her child's cafeteria meals. In fact, it is getting downright competitive. 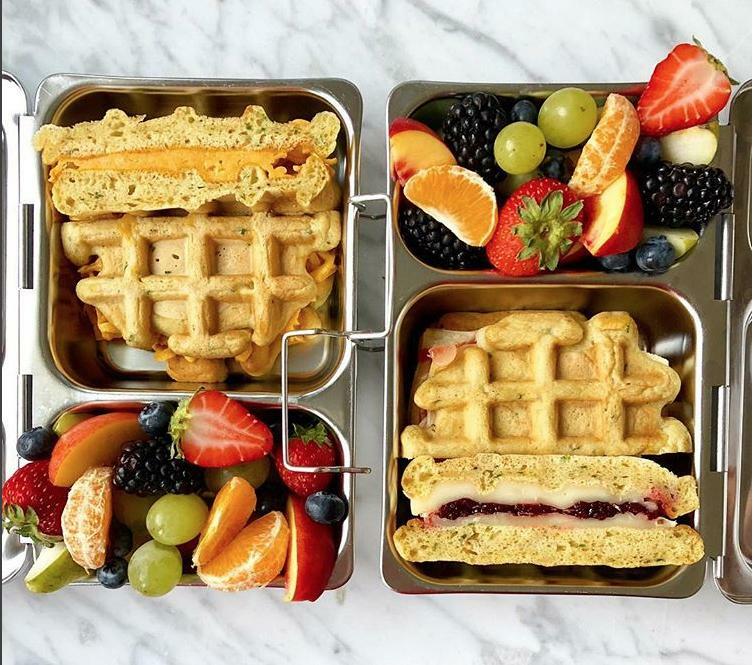 Mom Aviva Wettenberg dedicates her entire Instagram account to her lunch packing skills. She evens has a website dedicated to the art. 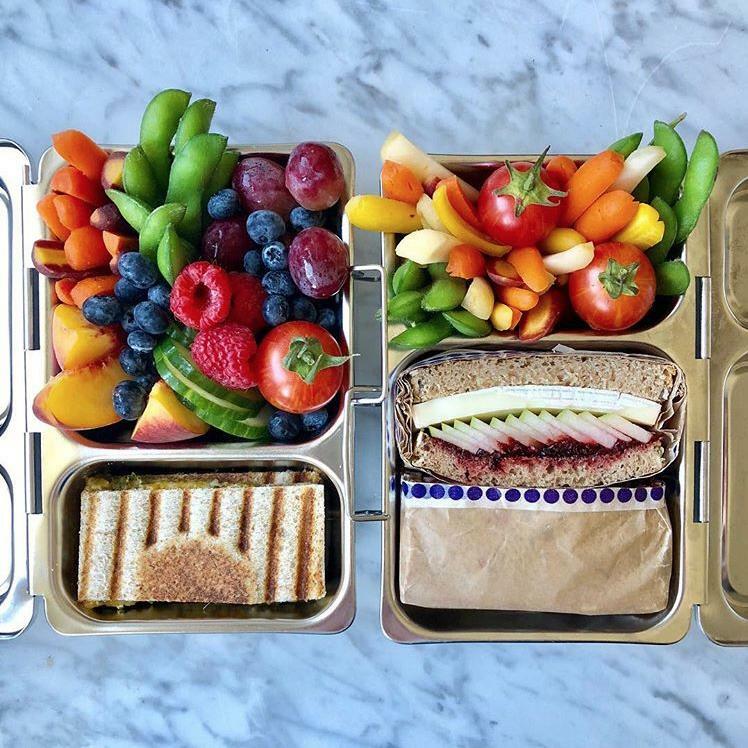 "Few things used to fill me with as much dread as packing lunches until I decided to document the lunches I was packing and started to look for inspiration outside of my own kitchen," she explained. "I share my girls' lunches on Instagram every day and will highlight some of my tips and tricks here." One of those tips is to use the LaLa Lunchbox app — which helps you plan your week out ahead of time and provides fun recipes to try. Another pro tip: the reusable PlanetBox — which sorts your school lunches into tiny compartments, providing optimal Instagram content. Aviva is also able to coordinate two school lunches, with very different dietary restrictions. One is vegetarian, the other is dairy-free. "Two on-the-go lunches today. Thanks to the weather, my big kid has outdoor lunch (how amazing is that??) and my little one is off on a field trip for the day," she wrote alongside a photo of nearly identical-looking packed lunches. "Little sandwiches for both — smoked tofu and spinach for one, chèvre, blackberries and mint for the other — and a pair of green salads." While Aviva and Jenny are hard to top when it comes to their gourmet school lunches, they have some stiff mom competition. Like Happy Little Lunch, who chronicles the lunches she packs for her vegan daughter in the second grade. "My alarm didn’t go off this morning and, man, this almost didn’t happen," she captioned a photo of a school lunch that did not seemed rushed at all. "All you evening lunch packers are on to something, but I guess I like living dangerously!" She still managed to whip up cinnamon toast sticks, baked tofu, crispy kale, pear slices and grapes. Apriums • Freeze-dried strawberries + blueberries (crunchy + sweet)." 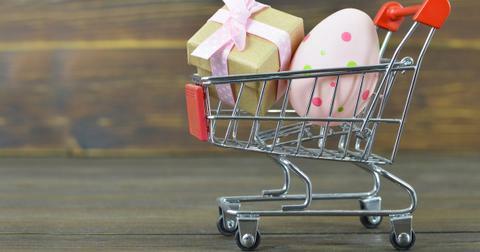 Social media is full of moms that want their followers to know that the traditional packed school lunch of a peanut butter and jelly sandwich with a carton of apple juice, and some chips — or god forbid, cafeteria food – is not good enough for their kid. 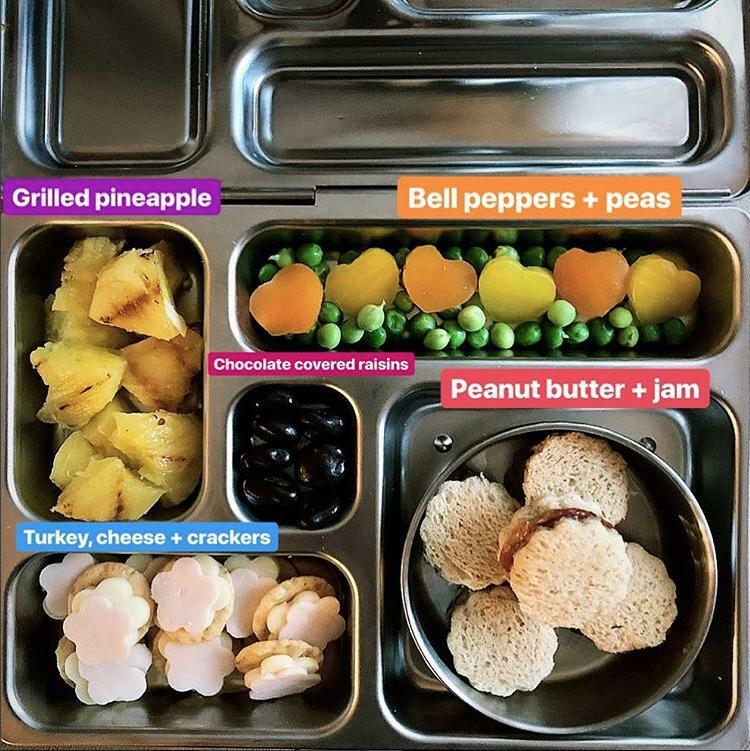 Meet Heather, whose Instagram account @thedailylunchboxspot, is dedicated to the meals she preps for her 3- and 4-year-olds. 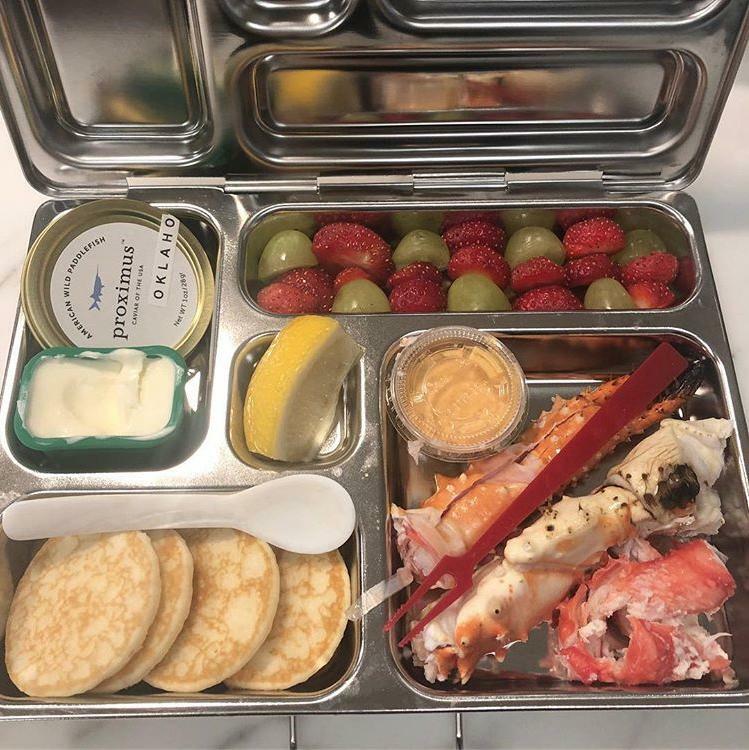 "Got a little cookie cutter happy with today’s lunch, but I find that my kiddos will often try foods that look cute over foods that don’t," she captioned one boxed lunch. "PB&J on whole wheat (replace with sunbutter or cream cheese & jam if bringing to school), tiny crackers with cheese and roasted turkey, little bell pepper hearts on top of peas, grilled pineapple (used a grill pan on the stove. Gives it a smoky flavor that’s a little less tangy) and dark chocolate covered raisins in the treat spot." So, what happens when dads try to take over school lunches? Just ask Jason, who had to take over for Jenny when she went out of town. By the end of the week, let's just say Jason was over the whole "pretty lunch box" idea. "Guess what?? That little ^%#@ did NOT eat the avocado," he jokingly captioned a photo of a very ripe avocado and some cash inside the lunch box. "He actually threw it away and told me he ate it. Anyway, here’s Sid’s final #daddylunch. Clockwise from top left: organic half-avocado (aged 5 days, found in dumpster behind pre-school), and 9 bucks (just go to the bodega and get whatever you want and NEVER LIE TO ME AGAIN, OK SID?!)." 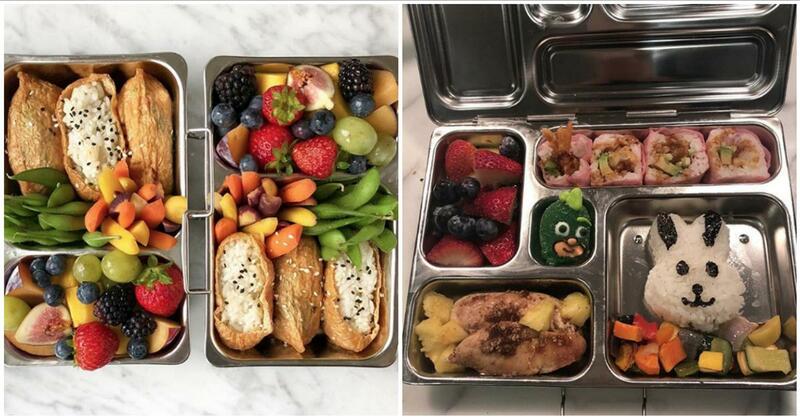 At the end of the day, this #kidslunchbox trend is making us realize our parents were just straight up lazy. (Just kidding mom, love you and your basic ham-and-cheese sandwiches).